Mapping Networks - Chicago Hack Night. 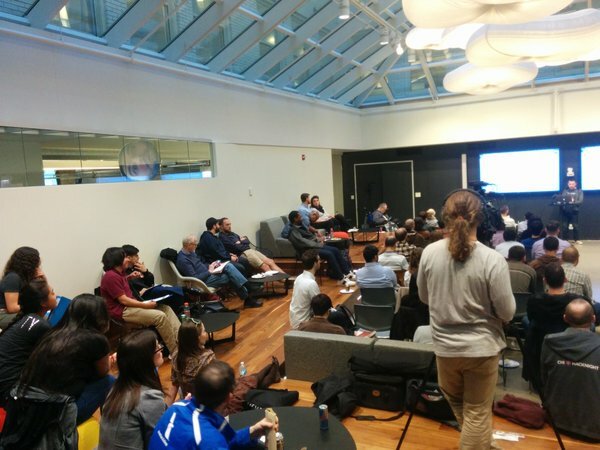 A few weeks ago I posted this photo, with a story about my attendance in weekly ChiHackNight meetings in Chicago. Every week between 80 and 120 people attend and the event starts with a round of introductions. As this happens I'm impressed with the range of talent in the room, and frustrated that the introduction process does not lead to greater connections beyond what takes place each week. I've begun to Tweet my introduction as an example of what I hope others will do. I clicked into the link and found this graphic, and two others like it. Alex Soble was thinking along the same lines as I've been, so as people were introducing themselves he was categorizing them on his laptop. After a few other steps, he created this graphic, showing the mix of talent in the room, and showing how some talents, such as web developers, are more represented than others. You can follow what Alex did, and what value he thinks this offers, by visiting the link above. I've been involved in hundreds of conversations over the past 20 years focused on solving the complex problems that face Chicago, and almost always we come to a point where we're talking about "getting the right people" into the conversation. However, in most gatherings, I don't see attempts by organizers to map who is in the event, for the purpose of understanding who else needs to be involved, or for the purpose of knowing if the group is growing from year to year, or if there is consistent participation by key people. I've attempted to map participation in the Tutor/Mentor Conferences I've hosted since 1994. You can view maps here. I created an on-line attendee list so people who attended could connect with each other. 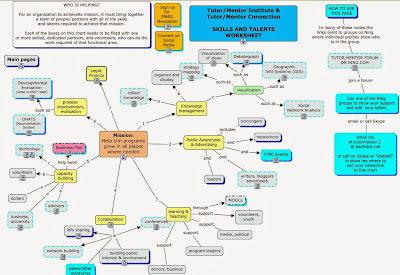 I've posted dozens of articles focused on network building, learning and network analysis on the Tutor/Mentor blog since I started it in 2005. Here's one titled "Want to Change the World? Who is Helping?" Knowing who is attending an event and what their talents are, or where they live in a geographic region like Chicago would be a huge first step in getting the right people connected and in giving voice to more people. However, I want to take it a step further. 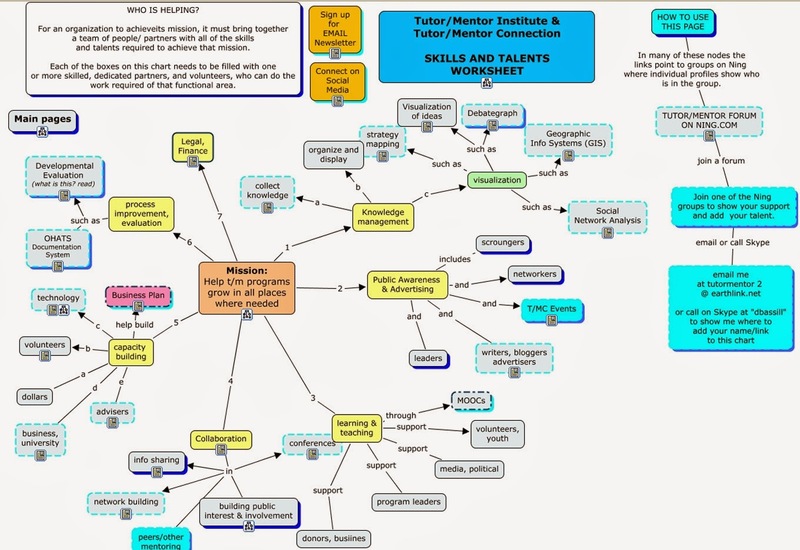 Below is a concept map that shows "talent" I seek to help me further the goals of the Tutor/Mentor Connection and Tutor/Mentor Institute, LLC. I feel this could be a worksheet used by any organization. If we can put names in each box, indicating someone dedicating time, talent and dollars toward that functional area, as part of a commitment to the overall mission, we'd probably be on the road to success if we filled most of the boxes. Thus, I hope people like Alex keep innovating ways to map who is in the room and that they will try to create a template that enables people attending an event to fill out a form as they register, so there is an automatic way to gather and report this information. I was chosen as a client for an Information Visualization MOOC hosted by Indiana University in 2015 and again in 2016. I described my goals in this article. The 2015 team made some progress (see report), and no students chose my project in 2016. Thus, when I share articles like this I'm inviting some of the people attending events like this to add their own skills to this effort. If we can make collecting and displaying this information easy and inexpensive, and convince higher profile organizers to embed this into their on-going activities, we could reach a tipping point where this becomes and automatic part of efforts to bring people together to solve big and small problems facing our communities. 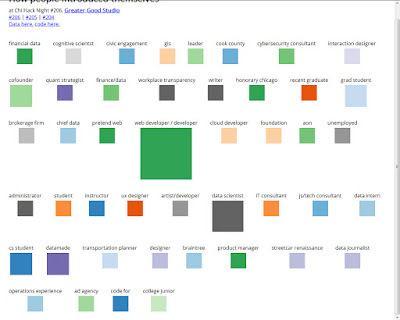 You can find a library of links to articles about collaboration, mapping, visualization, etc. in this section of my web library. 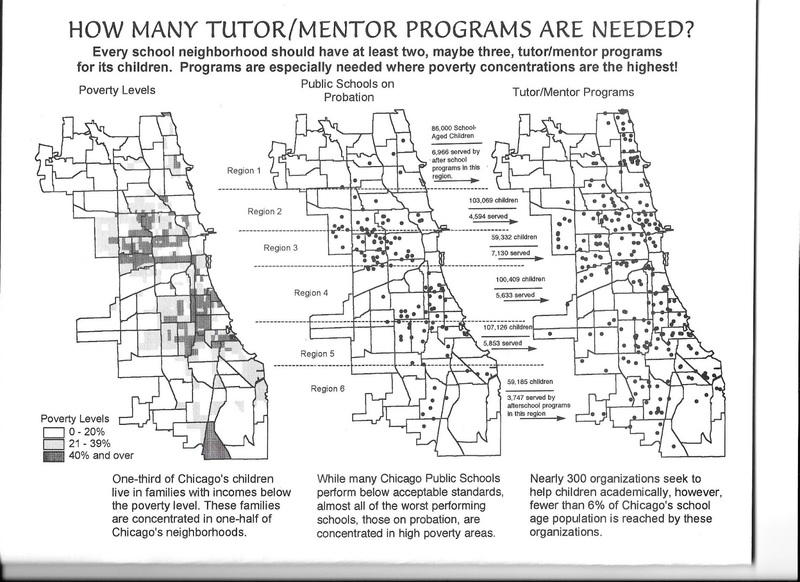 I created the Tutor/Mentor Connection (T/MC) in 1993 to help volunteer-based tutor/mentor programs grow in all high poverty neighborhoods of Chicago. One strategy to accomplish this goal was to create map-stories that would show locations where news media had focused full or half-page attention to a negative news story. Below is an example from the 1990s. We were using donated ESRI software at that time. As you know, maps are layers of information, drawn from spreadsheet data. In the graphic above, you can see the newspaper story we were focusing on, and you can see a map, color coded to show high poverty areas. You can also see what section of the city this was in. If you click on the image and enlarge it you can see that on the map we have icons showing known non school tutoring and/or mentoring programs in the map area, plus locations of poorly performing schools in the area, and assets (businesses, faith groups, hospitals). Below is another example, showing how map stories can be created following news stories that focus on the tragedy, but seldom on strategies to prevent future occurrences of the same bad news. On an interactive map you'd be able to look at these tables, but with maps created on a desk top set up, we needed to print the tables and post them with the maps, as shown here. View this slide show to see several other map-stories from 1990s, with data tables included. To create these map required people with special GIS map making talent. I depended on volunteers to do this work between 1994-2008, except for a few intern hours I was able to fund in 1994-1995. I could never find foundations who'd provide the funds to do this work. It was not until 2008 that we found funds, via an anonymous donor who gave a one time gift of $50,000, to re-create our desk top mapping as an interactive program locator that went live in 2009. This map has the same layers of information as the one above. You can zoom into different sections of the city and add layers of data to create map views, like shown below. You can mouse over icons and see who the organization is. You can double click on green stars and go directly to the web site of organizations on the map. Unfortunately we ran out of money to finish developing this in 2009 and the financial crisis that started in 2007 ultimately caused the non profit that created the T/MC to discontinue support for this strategy. Not only was I not able to finish developing the platform, I've not been able to update it since 2011 and since 2013 several parts are no longer working. Thus, I was never able to build in the features that would enable users to pull up data tables for the map areas shown, which is a common feature for sophisticated GIS map platforms. I was also not able to build layers showing Chicago political wards, or, police, library and fire stations. Nor was I able to market this extensively and teach youth organizations, media, donors and policy-makers to use it. At the peak of our service between 2008 and 2011 we were creating map stories using our desk-top ARC GIS software, donated by ESRI, and also creating map stories using the interactive map. Visit this map gallery to see maps and stories created using the desk top. 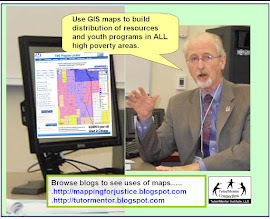 View this section of the Tutor/Mentor blog to see map stories created using the Interactive Program Locator. However, this was still not the final goal. The graphic below shows what had been created, but also points to functions that are still on the drawing board. The goal of the T/MC was to help programs grow, which meant helping them get the dollars needed to grow. 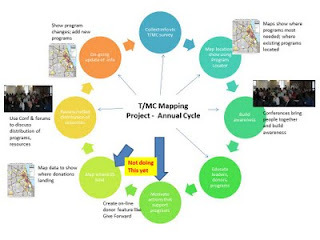 If you look at this page on the Tutor/Mentor Planning wiki, you can see a vision for using a map platform to attract donors to programs shown on the map, using map-stories and quarterly events to attract donor attention and point it to different neighborhoods. Our goal was to have donations made via a special overlay, so that we could capture donation amounts per year, for each organization, and aggregate that data for each zip code or community area. Thus, we'd be able to show what neighborhoods were less funded than other neighborhoods and attempt to motivate additional funding by sharing this information. In doing so, we could increase the flow of needed operating dollars to tutor/mentor and learning programs in all high poverty neighborhoods of Chicago, meaning more kids would get the extra help they need to move through school and into jobs. Furthermore, by not being able to get this model fully functioning in Chicago, we've not been able to share it, or lease it, to other cities, and we've not been able to create version that would focus on other supports needed in each high poverty neighborhood. All of this is still possible. It just takes the commitment of one or two benefactors/investors/partners and the talent of one or two web developers. When working, the model could apply to any city. 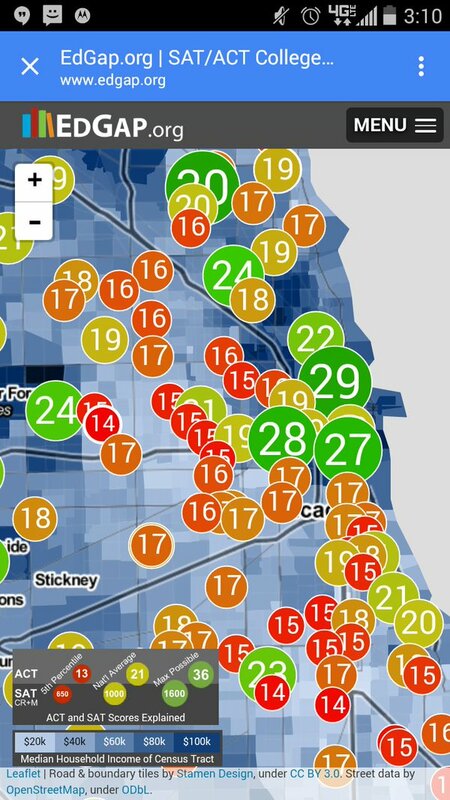 I saw the Tweet below today, and encourage you to view the interactive map on the DNAInfo web site, to see how population has changed in Chicago over the past 30 years. If you compare areas of White population growth and decline in Chicago since 2000 with Black and Hispanic growth you'll see that in many cases White flight from neighborhoods with growing minority populations continues while gentrification of neighborhoods by upper income Whites is causing lower income people to move out. 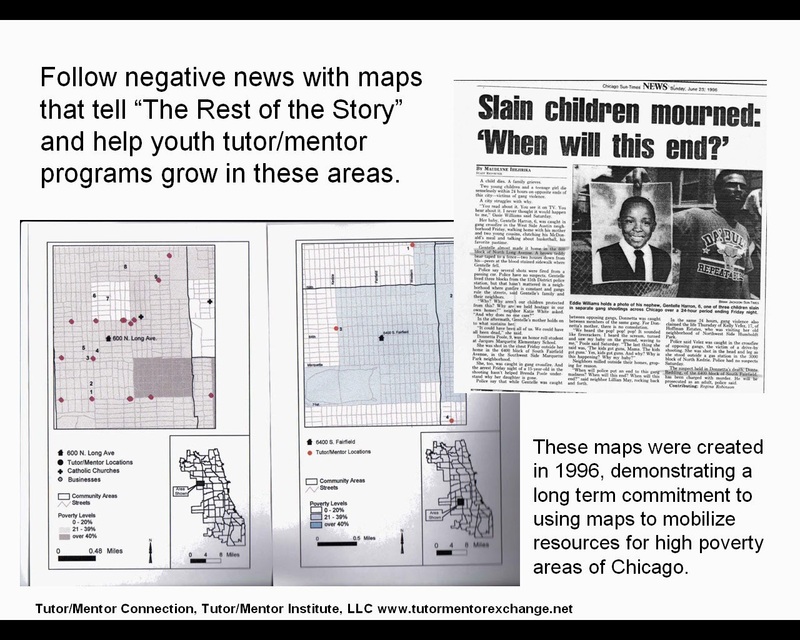 When I created the Tutor/Mentor Connection in 1993 there were far more school-age youth living in the South part of Chicago. 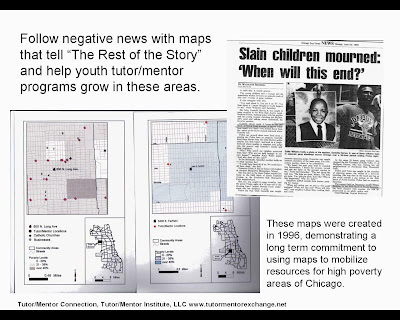 This set of maps was created from a 1997 study of non-school youth serving programs in Chicago. 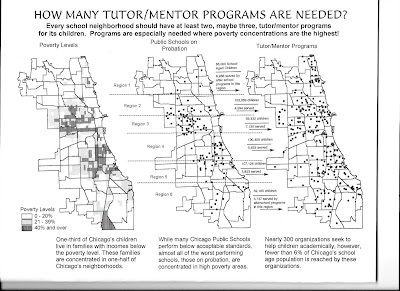 It shows the number of youth in each of six Chicago Public School Regions and plotted locations of existing non-school tutor/mentor programs. If you compare this map to the DNAInfo maps, you can see the change. I've been trying to map data like this and share it with the public for 20 years, with the goal of mobilizing more people to support youth and families. While I've had inconsistent success in doing that, other factors, such as changing demographics and continued race and segregation issues, have also made it difficult to build strategies that reach youth where they live with a wide range of programs that help youth move through school and into jobs and careers. Map info like this just has not been consistently available. And now that it's more available, there still are too few people using the data to mobilize attention and resources to fill map areas with needed services. That's just my conclusion from a quick look at the map. What does it tell you? Here's a new crime mapping resource that came across my @tutormentorteam feed on Twitter today. 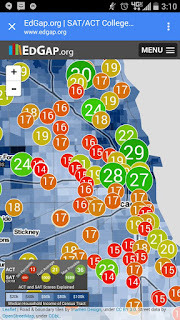 Use with other interactive maps to build a case for support of youth and families in different neighborhoods where map indicators show a high need for extra help. Note that you can create a map-view focused on your own city, or zip code, then share this with a tweet. When you do that your map image will be shared inviting others from your area to use the information. I learned about this mapping platform via my Twitter feed. I am on Twitter @tutormentorteam and invite you to connect with me to share resources like this and encourage more people to use them. Thanks to my friends at GenerationAll for sharing this image on Twitter, showing a Chicago view taken from the EdMap interactive site. The color circles on the map represent high schools with 150 or more students, and show the average ACT score for each school. The higher scores are in shades of green and the lower scores are in shades of red. These are overlaid over a map showing demographics. The lighter shades of blue represent areas of higher concentrations of poverty. If you zoom in closer you can clearly see a correlation between low ACT scores and high poverty. This is the message I've been providing with map stories for nearly 20 years. 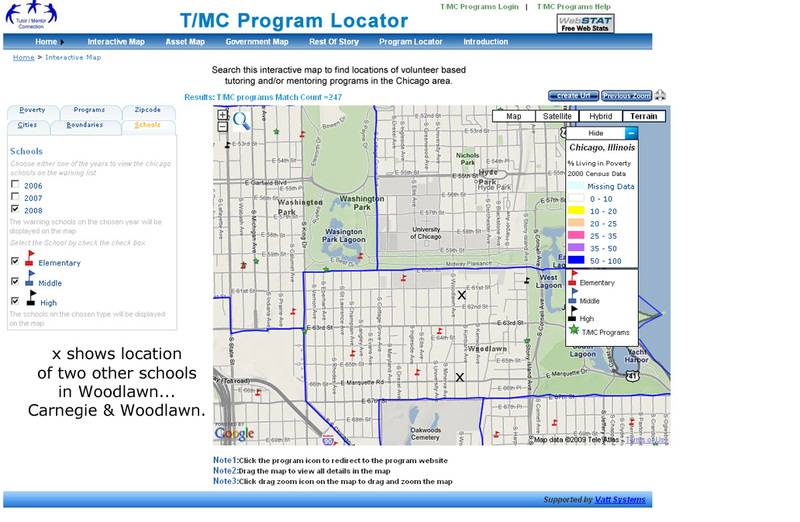 Below is a map made using the interactive Chicago Tutor/Mentor Program Locator, showing the Woodlawn area of Chicago, and showing public schools that were on the 2008 Illinois schools low performance list. The green stars on my map are locations of non-school tutor/mentor programs in the area. On this map there are none within the Woodlawn area, which either means I do not have them in the database, or they do not exist. You can also add layers of information showing poverty levels, and layers showing assets, such as faith groups, colleges, hospitals and businesses. A map view centered around a specific school could show political leaders and assets who should be working together to improve in school and out-of-school time learning opportunities for youth in that map view area. Youth in local schools could be creating these map stories. Below is a presentation showing how other people can create their own map images, and then use them in blogs and newsletters and on social media to draw attention to a problem and to draw people together to try to reduce the problem. While this uses the Program Locator as an example, any interactive map that enables you to zoom into a zip code, or a single school location, can be a platform used to create a jpg image following the same steps. The Program Locator was built in 2008 using what was then advanced technology, What's available for making maps in 2016 is much more sophisticated, but I don't have the dollars or talent to rebuild my platform, or to keep the data up-to-date. Thus, I'm sharing examples of how people could create map-stories using any platform, and using my stories as an example, while I'm also looking for partners in business, universities, and/or philanthropy, in Chicago, or any other city, to help upgrade my own mapping resources. If you'd like to explore this just email me at tutormentor 2 at earthlink dot net.